Sun filled Challenge delivers great success for Aquamoves! - Aquamoves – Indoor and outdoor pools, fitness facilities and programs in Shepparton, Victoria. 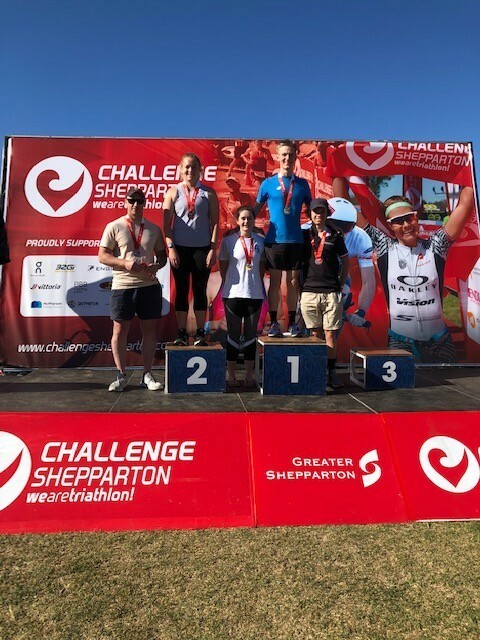 The weather gods shined brightly across Victoria Park Lake over the weekend, as more than 1000 athletes took part in the Challenge Shepparton Triathlon events. Aquamoves Junior Elite Team: Hayley Hogan, Jack O'Mahony and Sam Eddy took out first place in the Sprint distance. Aquamoves Elite Team: Grant Hicks, Brennan Swift and Liam Edwards came second in the full Challenge distance. Left to right: Aquamoves Staff Team Members Marcus Cook and Kate Flynn with Aquamoves Junior Elite Team Members Hayley Hogan, Jack O'Mahony and Sam Eddy. The three Aquamoves teams were spearheaded by the Junior Elite squad, who took the Sprint Distance win in an astonishingly quick 55 minutes. Swimmer Hayley Hogan emerged from the water in third place (only just behind some of the elite male athletes), providing a more than excellent start for the Junior team. With little wind to hamper the bike leg, Junior Elite cyclist Sam Eddy was able to take the lead and close the gap in the field by more than three minutes, averaging 44 kilometres per hour over the 20 kilometre course. Not to be outdone, the team’s runner Jack O'Mahony delivered five kilometres in a blistering time of 17 minutes to make sure they finished first by a long streak. Aquamoves Centre Manager Marcus Cook said it was an absolute pleasure watching local national-level junior talent on display. “They are humble, dedicated and were oh so fast across each of their respective disciplines. The time of 55 minutes will take a serious effort to beat in future years,” Mr Cook said. The Aquamoves Elite team tackling the full distance course was again in the box seat from the get-go after a powerful 25 minute swim by the behemoth that is Brennan Swift. 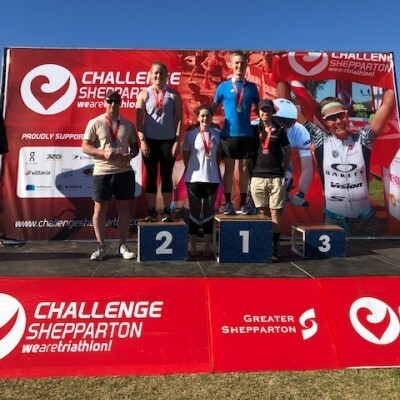 Aquamoves Elite cyclist Liam Edwards once again rode the wheels off his bike and mixed it with the pros to finish the leg in a tightly contested second place. The run leg was a challenge in the warm conditions; however Aquamoves Elite runner Grant Hicks took it in his stride (literally). He pushed hard across the 21 kilometre course to finish off a really strong campaign by the lads who only missed top place on the podium by a matter of minutes. 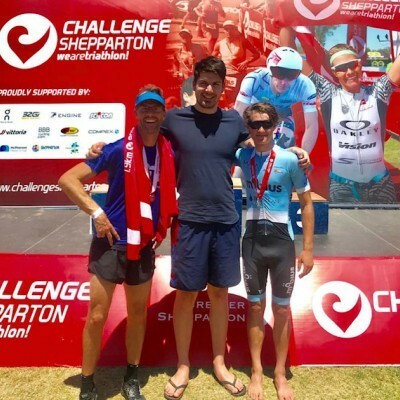 Aquamoves Elite swimmer Brennan Swift said it was great fun to be part of a team that involved other locals who are specialists in their chosen sport. “Watching the bikes and cheering home the runners makes a great day out and one that I will be keen to be part of again next year” he said.